Bailey ‘BadBoy’ Sugden and Jordan Vucenic will go head to head again next April, after their electrifying contest on Saturday 21 November was stopped at the end of the fourth round on medical advice. Held at The Premier Suite in Cannock, the fight for the Strike 2 Win! British title saw Bailey take on his unbeaten opponent from Mahico MMA under this brand new format of professional MMA with no submissions. Although often in the shadow of his two superstar brothers Chad and Regis, Bailey is widely regarded as one of the hottest prospects in the country. 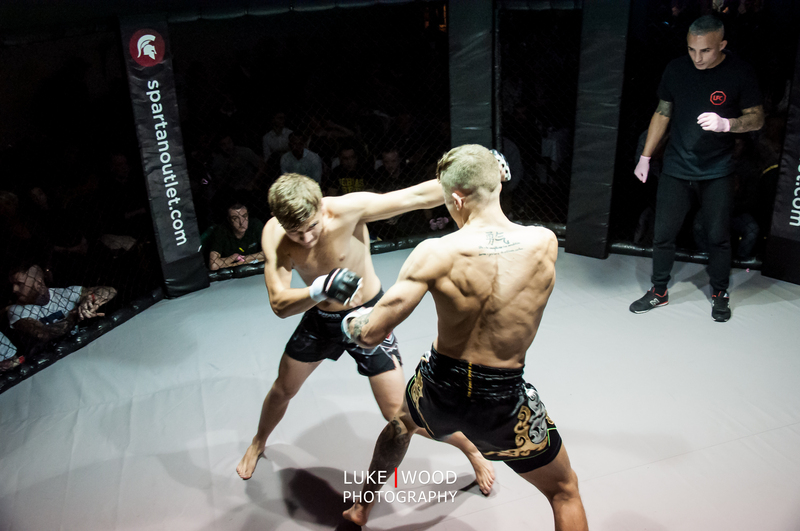 Despite having only a few months to prepare, fighting outside his normal weight class and being more used to staying on his feet and striking, the Suggy’s Gym 18 year-old jumped at the chance to fight under the new format. With Bailey dominating the striking from the outset, as anticipated Jordan took it to the ground but was unable to secure any real striking and the referee stood them back up. As Bailey went back to work, Jordan used all his wrestling and judo skills to good effect with trips and take downs, a pattern which continued over the first three rounds with hard, fast and ferocious exchanges back and forth. The fourth round saw Jordan take Bailey down again but this time he was able to land some big punches and elbows on the floor. Getting up, Bailey returned with strong strikes and with his trademark iron chin walked through a beautiful jumping chin landed by his opponent. Concerned over some swelling on Bailey’s eyes at the end of the fourth, as both fighters stood to begin the final round the cage-side paramedic advised the referee that, because of swelling to his cheek, the fight could not continue due to medical reasons. “After four of the most exciting rounds of the night, both camps were gutted that the contest was brought to an end in such an unfortunate way,” said Dean. “The two fighters were applauded by the crowd and a rematch was agreed there and then. Saturday 16 April 2016 will see them headlining on Road to Glory 2, this time under K-1 rules, at the Magnus Sports Centre in Newark.